The Wikipedia entry notes that S scale has been around for more than a century – and commercial models have been produced since the 1930s. Yet there are many people – including experienced craftsmen who have been hobbyists for decades – who have never seen a layout built to 1:64. 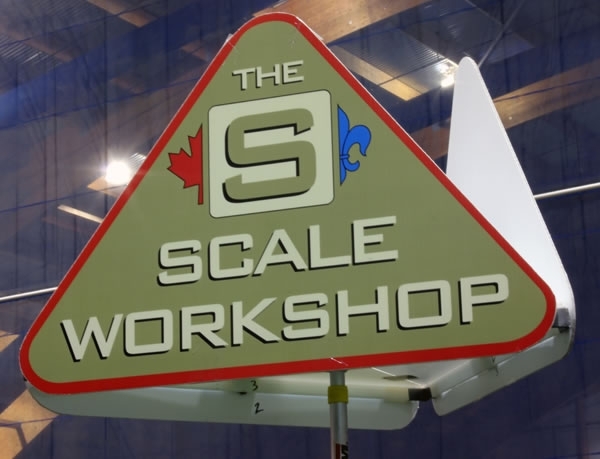 The members of the S Scale Workshop – a group of friends mostly in the Southern Ontario area – have been doing their part to change that. The Workshop was already well established when, in the mid-2000s, members decided to build modules to an S scale version of the Free-Mo standard. 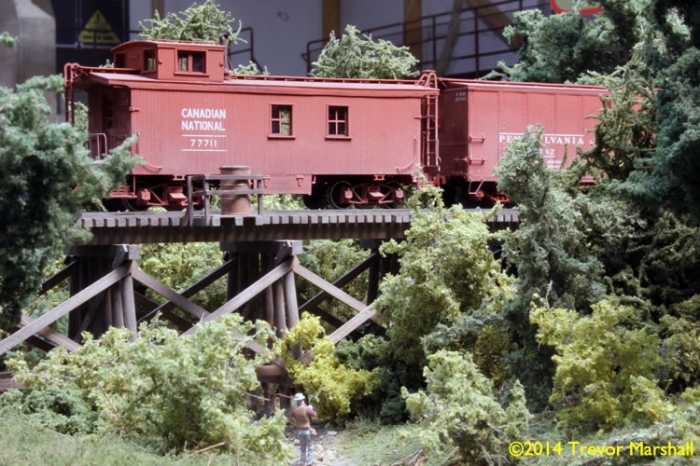 Since the new modules made their first appearance at a Canadian prototype train show in Copetown, Ontario in 2006, the Workshop has taken S scale to exhibitions across southern Ontario as well as to Trainfest in Milwaukee WI (2011), The Railroad Hobby Show in Springfield MA (2012), and the NASG Convention in Scranton PA (2013). But we’d never exhibited in the province of Québec – which was odd, given that one of our most prolific members – Simon Parent – calls the Montréal area home. This year, we corrected that oversight. 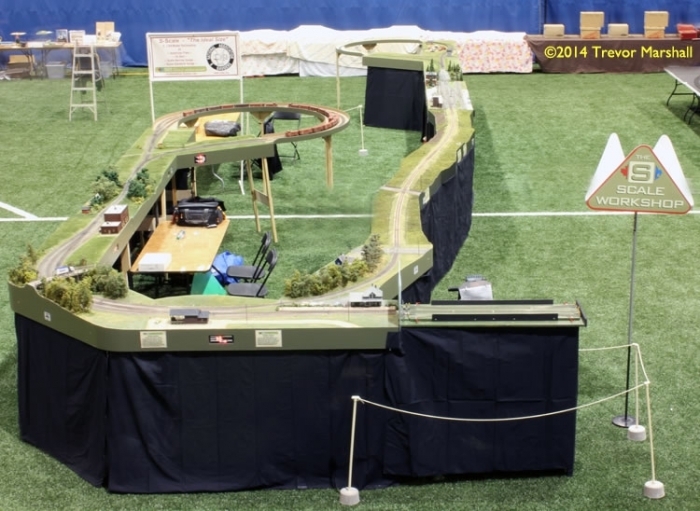 The opportunity presented itself in the form of the first-ever North Shore Train Show, held October 4-5 at an athletics complex in the Montréal suburb of Laval. Simon presented Dunham Junction – a four-section module featuring a working junction built through a 180-degree turn-back curve. Simon also brought one of his earliest modules, featuring a river crossing. 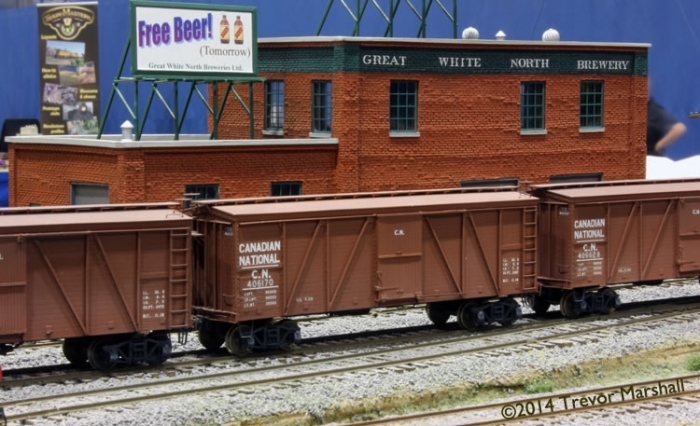 Andy Malette displayed his two-section switching module, featuring the Great White North Brewery and the Simcoe Ice Company. 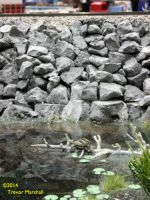 Andy also brought along a module representing a typical Ontario wetlands scene, featuring a main track built on a rubble causeway. I presented two modules – Judge Farm and Division Street. Each features a single main track travelling through a large-radius arc (more than 30 feet), past meadow, pasture and farm field. 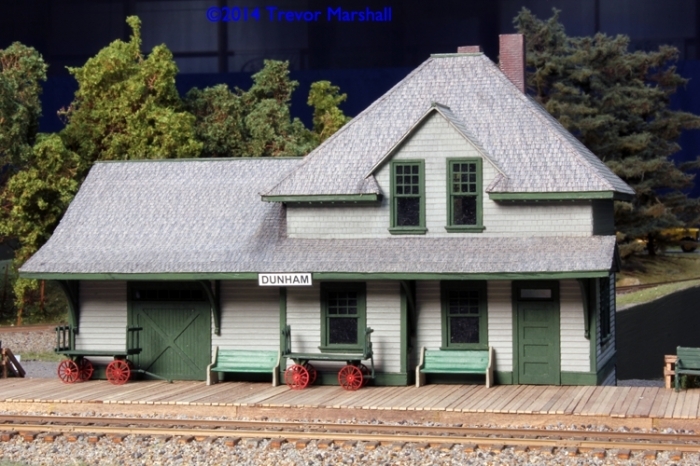 I’ve been building these modules for a series for TrainMasters TV – a web-based television show about the hobby. And the Laval show was the first time they had appeared in public. Simon also contributed two return loop-module sets – including one featuring a three-track staging yard, and the other featuring a 90-degree crossing guarded by a tower. 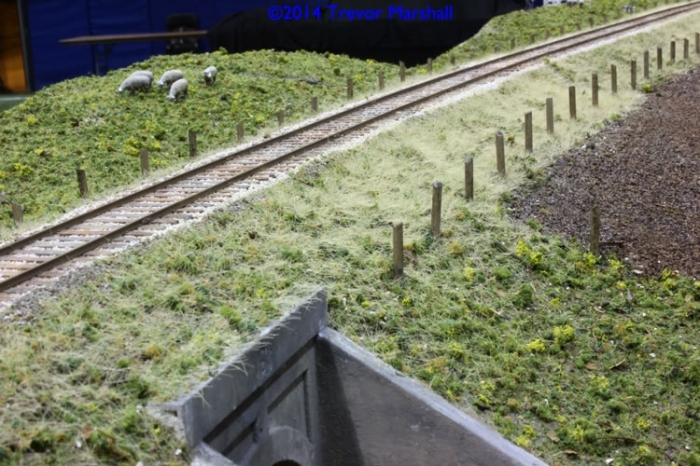 These loops made their first appearance at this show and they made a real difference to how we operate the layout for the public. Previously, the Workshop modules would be set up in a point-to-point fashion, with a train-length turntable/staging yard at each end. Since these had to be portable, trains had to be fairly short – four cars was typical. Thanks to Simon’s work, in Laval we were able to run some very long trains for the first time, including a long coal drag and a 22-car freight behind double-headed steam power. The loops made a real difference to the presentation, as these videos shot by Simon demonstrate. Simon, Andy and I were joined by friends Claude Demers, Fredrick Adlhock and Brian Nicholson. 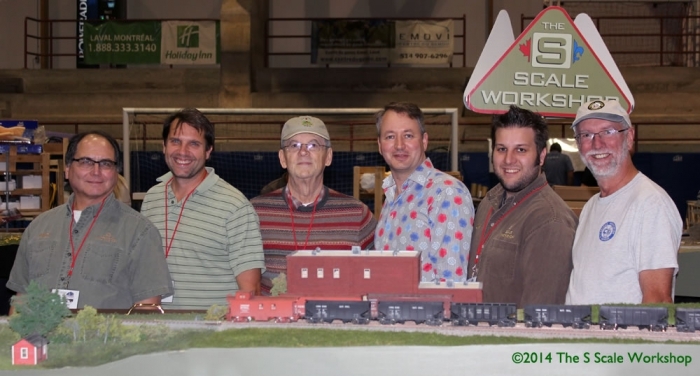 While they did not have modules, these three gentlemen were invaluable in helping us set up, run trains and tear down. We could not have done it without them. Thanks guys! Our friend and fellow Workshop member Jim Martin also deserves special mention. He was unable to attend this show, but he made sure we had our S Scale Workshop and NASG signs, flyers and handouts, copies of features on the Workshop from popular hobby magazines, and other materials that helped us look good. Jim also supplied a train-length turntable for the third leg of Dunham Junction, and even loaned Fredrick some S scale equipment to help populate the layout. Our exhibition included custom-built brass locomotives, ready-to-run rolling stock in brass and plastic, and kit-built equipment from resin, plastic, brass and even wood components. 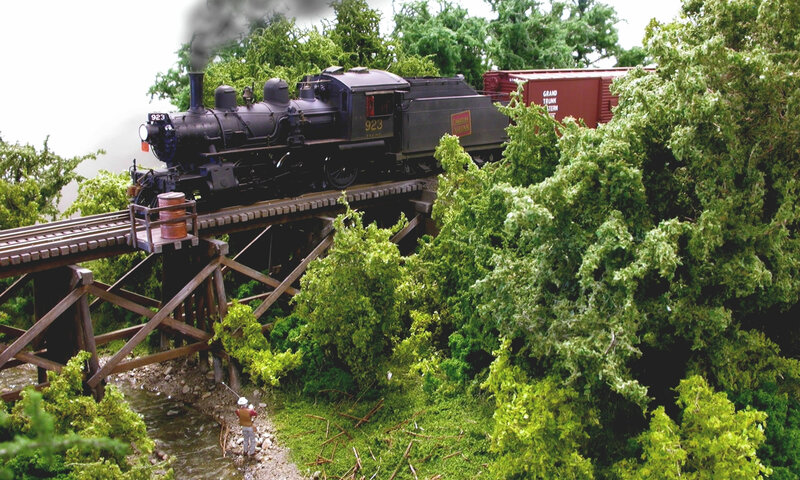 As with most S scale layouts, we’ve also made careful use of many details and scenery items marketed as HO or O scale. There were many examples of scratch-built structures, bridges and other detail elements on display too. With Simon’s return loops and my open-country running modules, the layout configuration was very different from previous exhibitions. We’re looking forward to a future show when we can combine these new pieces with other modules that were unable to make the trip to Laval. We’ve already received a couple of invites to future shows where we might be able to do just that. 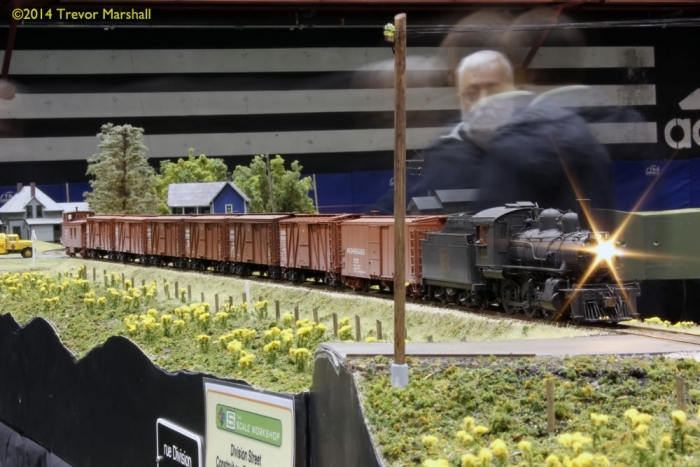 This was the first year for The North Shore Train Show, so it came as no surprise to us that attendance was on the light side. 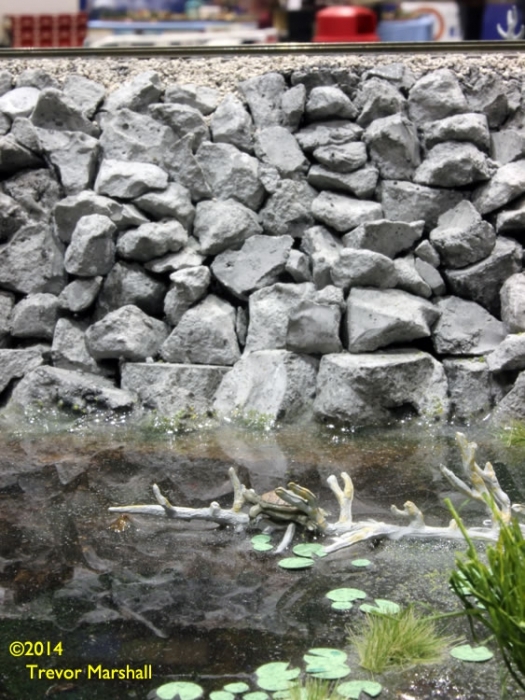 But over the two-day show, several hundred visitors learned about scale modeling in 1:64. Many times over the course of the show, visitors commented on the size, quality and performance of the equipment on the layout. And – as is always the case when the S Scale Workshop exhibits – we heard several comments along the lines of “If I didn’t already have all this HO…” and spotted a few people sizing up 1:64 and wondering how quickly they could unload their HO equipment on eBay. While we know that’s unlikely to happen, we also know it means that we’ve dispelled misconceptions about “S Scale” being just another term for “American Flyer” or “Toy Trains” – and that’s a good thing for those of us working to higher standards in 1:64.